Paul and Michelle Wood has an unusual scheme for raising money. They plan on giving away their house. Confused yet? Here’s the scheme: Paul and Michelle are going to have a trivia contest. Starting November 2 and running for the next 12 weeks, all you have to do is answer a trivia question daily for a chance to win their luxury, £425,000 home in West Yorkshire, England. The more ads you click on, the more chances you get, up to 20 per day. 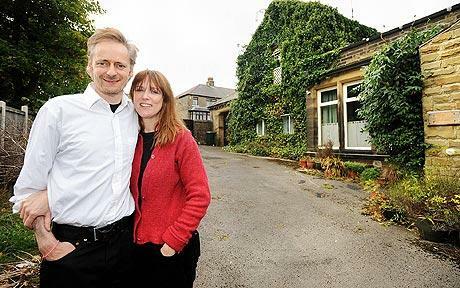 Paul and Michelle are hoping to sell £850,000-£1 million worth of ad space on their house raffle website. Apparently there’s no catch. They’ve checked with gaming authorities and have done everything by the book. So far as I know, the 120-year-old stone house is in good shape and demon-free. I imagine if there was something wrong with the house, it would’ve come to light by now.